Combined Task Force 150 (CTF 150) is one of three task forces operated by Combined Maritime Forces (CMF). 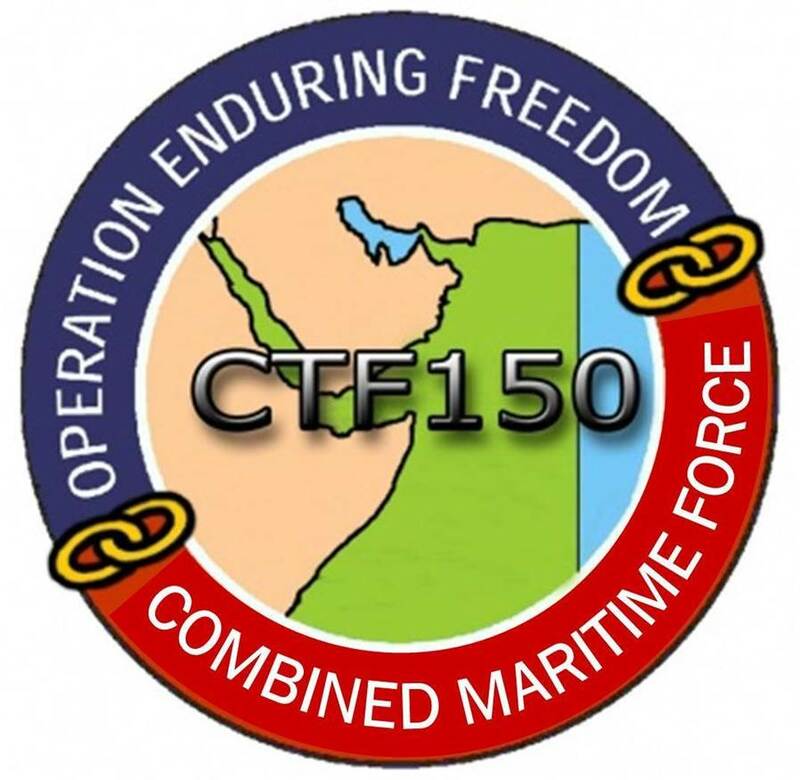 CTF 150’s mission is disrupt terrorist organisations and their related illegal activities by restricting their freedom of manouevre in the maritime domain. The activities of CTF 150 are a critical part of global counter-terrorism efforts, as terrorist organisations are denied a risk-free method of conducting operations or moving personnel, weapons or income-generating narcotics and charcoal. The crew of the French Marine National destroyer Jean de Vienne with 530kg of heroin valued at $120M USD seized on 27 March 2018. This was their second major seizure in 2018. Maritime Security Operations (MSO) also ensure that legitimate commercial shipping can freely transist the region. CTF 150’s Area of Operation includes some of the world’s busiest shipping lanes and spans over two million square miles, covering the Red Sea, Gulf of Aden, Indian Ocean and Gulf of Oman (but not the Arabian Gulf, which is the responsibility of CTF 152). This area is a vital artery of world trade from the Far East to Europe and the US, with thousands of shipping movements per year including the transportation of over 27 million barrels of oil. In addition, the AOR contains three narrow waterways, known as ‘choke points’, where vessels are required to pass closely between two shorelines. These include the Strait of Hormuz, Bab El Mandeb and the Suez Canal. This means ships have limited maneuverability and are more vulnerable than would otherwise be the case in open waters. The crew of the Royal Australian Navy frigate HMAS Warramunga transferring 100kg of heroin onboard, following a seizure on 7 Jan 2018. Their total confiscation of narcotics in 2018 was valued at nearly $500M USD. Task Force 150 was a US Navy formation under the control of the US Naval Forces Central Command (CENTCOM). After the terrorist attacks of September 11 2001, it was re-established as a multinational coalition in order to undertake counter-terrorism operations at sea as part of Operation Enduring Freedom (OEF). The coalition has grown and evolved beyond that operation’s scope to encompass and address widely perceived maritime security threats to member states. CTF 150 is a multinational task force. Participating nations have included: Australia, Canada, Denmark, France, Germany, Italy, Republic of Korea, Netherlands, New Zealand, Pakistan, Portugal, Singapore, Spain, and Turkey, United Kingdom and United States. Participation is purely voluntary and no nation is asked to carry out any duty that it is unwilling to conduct. Command of CTF 150 is generally rotated between nations on a four monthly basis. Maritime Security Operations (MSO) are intelligence led and carefully planned to develop security in the maritime environment, thereby contributing to stability and prosperity on a regional and a global level. MSO deter and deny the use of the maritime environment for terrorism and the facilitation of malign activities. MSO complements the counter-terrorism and security efforts of regional nations on land. MSO are conducted under international maritime law and international maritime conventions to help ensure security and safety in international waters. This ensures that all commercial shipping can operate freely while transiting the region. CTF 150 vessels also assist mariners in distress and undertake humanitarian work as required.